Dance along to the sounds of Africa with the Burudika Band. No need to arrive early. Hear this vibrant African band composed of Harambe’s finest musicians, who fill the marketplace with lively, infectious rhythms of Afro-pop. “Burudika” is Swahili for “to be refreshed” so refresh, join the street party! DiVine is not your ordinary run-of-the-mill, ten-foot tall plant. In fact, DiVine is really performance artist Priscilla Blight who has brought her expressive talents to Disneys Animal Kingdom. Priscilla cleverly conceals herself in a towering, hand-made foliage costume. It is only when she moves that guests realize they are not looking at nature but at DiVine. DiVine does NOT sign autographs. *Due to her excellent camoflauge she is very difficult to spot. It will help to see a Character Attendant standing on the trail. Many guests consider this show as their favorite show. It is a can’t miss among the shows. There is bright colorful costumes, daring aerialists, fantastic vocalists and the tumble monkeys!. During busy seasons arrive at least 15-20 minutes early as the show is very popular. You will be divided into 4 sections: the elephants, the giraffes, the warthogs and the lions. Ask the seating Cast Member if you wish to sit in a specific section. I also recommend shows later in the evening or use FP. This is a Broadway quality production that will leave you thinking that all those original songs were actually in the movie, but they are not! The puppets are activated by their actual performer who is singing each line. Lots of color, action and fun songs are sure to leave a smile on the face of everyone. Arrive 15-30 minutes prior to the show during busy seasons or to choose the best seats. “UP! A Great Bird Adventure” is a new show that will feature Dug and Russell along with many beautiful birds. It displays the natural behaviors that are brought out by expert bird trainers. You might see the owls, hawks, vultures or even the Bald Eagle. A troupe of highly skilled acrobatic dancers perform to the beat of the African drum while displaying their incredible skills of dance and tumbling. You’ll be awed and you’ll truly enjoy this show. A Mandinka Harp built from a large calabash, cut in half and covered with cow skin to make a resonator with a long hardwood neck. Use Fastpass+ or book a special dining package! 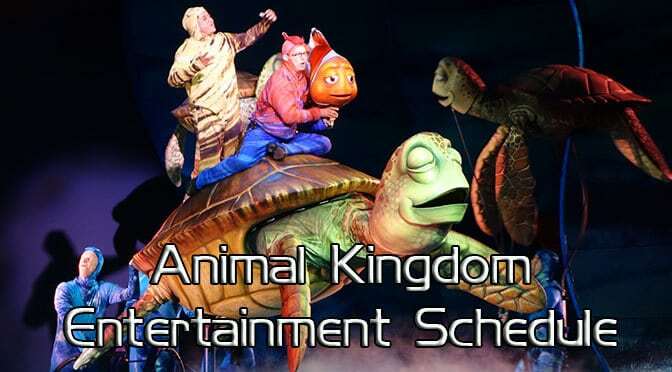 Fastpass+ guests will be seated near Expedition Everest and dining package guests will be seated in front of Finding Nemo the Musical. New show featuring floating water elements and light projections. It’s a good, but not great show. The Tam Tam Drummers of Harambe are a colorful West African inspired rhythm and dance performing group. Join in the fun and shake your booty with the dance leader. Awakenings at the tree of Life occur every 20 minutes with the first show around 8:40pm currently. Join in the festive, colorful street party in Disc Island across from Flame Tree BBQ. You see a live band, stilt walkers and dancers setting the scene for a party. Hi Kenny, which of these 2 shows would you recommend using my FP+ ? I read that Nemo can seat 1500 ppl. There’s plenty of seating for each show. Benefit at Nemo is better seats. Hi Kenny thanks for all the info , we love the DJ Annan show at animal it’s great fun and really unique lot of people dance and having fun we me and my famil just kept dancing the whole time what’s great idea Disney had its great to have a show with guest dancing. Hi Kenny, I see you have times for character dance party Mon., Tue., Wed., and Sat. Are they having it Thurs., Fri, and Sun. We were planning on going Sunday. Thanks.